Used by the Ancient Greeks and Egyptians and mentioned several times in the Bible, our love of cinnamon dates back many centuries. 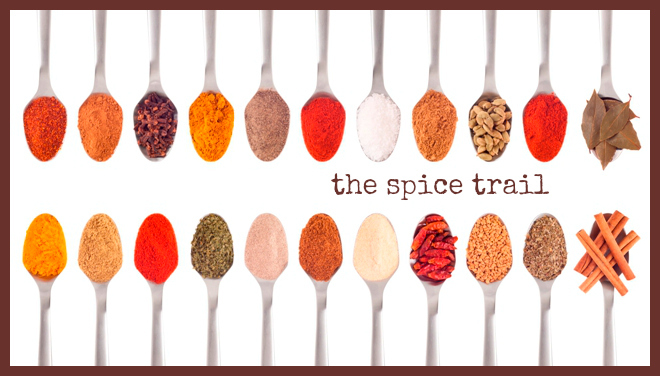 And judging by the dishes entered into December’s celebration of cinnamon in The Spice Trail, it is clear this spice is as popular as ever. These warming meatballs from Heidi at Mamacook feature cinnamon, coriander and paprika and get an extra spicy kick from a touch of harissa and are sure to be a big hit with all the family. Although Heidi does suggest you might want to up the harissa if there won’t be any little ones joining you for dinner. When this stew is cooking, Bintu from Recipe from a Pantry says it inspires a follow-your-nose-to-the-smell-and-bury-your-face-in-it moment and I totally believe her. This looks like my kind of temple food; a dish that tastes good and does you good. And you just know, one bowlful won’t be enough. Perfect for these post-Christmas days, this turkey chilli (a second entry from Bintu at Recipes From a Pantry) is low on calories, tasty, easy and cheap as chips, using leftovers and store cupboard staples like chickpeas and beans. A wonderfully healthy winter warmer as an antidote to all that festive gluttony. This tempting Rogan Josh from Fiona at London Unattached is another timely recipe for those looking to cut down on a few calories in the New Year. Coming in at only 350 calories a portion, this curry would be perfect for a 5:2 diet fast day. Low on calories it might be, but it’s definitely big on flavour. Next up is this beautiful lamb tagine from Jacki, with whom you’ll often find me chatting on Twitter about food and Aga cookery. Jacki doesn’t blog herself but I was more than happy to feature her one-pot-wonder of a recipe here on Bangers & Mash. We have another dish bringing together that perfect partnership of lamb and cinnamon, this time in the form of an Ottolenghi-inspired warm salad with slow roast shoulder of lamb accompanied by roast chicory, swede, carrot and parsnip. The deliciously sweet and sour dressing is created from honey, lemon, cinnamon and pomegranate molasses for a surprisingly sunny winter salad. We often make drop scones on the Aga for breakfast but I think next time we might be giving these apple pancakes from Mamacook a whirl instead. Apple and cinnamon is of course a match made in heaven, and drizzled with a little honey I reckon these pancakes would be just perfect for a lazy Sunday brunch. I was thrilled when Jen from Blue Kitchen Bakes’ email dropped into my inbox with her recipe for Speculoos Shortbread, including how to make your own Speculoos spice mix from scratch. I have been addicted to Speculoos since picking up a jar of confiture de speculoos in France last summer, and I’m very pleased to now be able to make my own spice mix. And I think the first thing I’ll be baking with it is a big batch of this scrummy shortbread. Christmas just isn’t Christmas for me without a good trifle. And this trifle from Laura at How to Cook Good Food looks like a very good trifle indeed, packed full of gorgeous fruits and spices in the form of dates, apricots, caramel clementines, vanilla and cinnamon. It is also an excellent way to use up leftover Christmas cake. These pretty muffins from Bintu at Recipes From a Pantry are an absolute breeze to bake, and made even easier because you don’t have to peel the squash. Result! A lovely baked treat for breakfast or at teatime and an ideal way to sneak a little vegetable matter into little people. I have only recently discovered Kate’s blog, Veggie Desserts, and I absolutely love it. Kate freely admits she is obsessed with using vegetables in her desserts, and the veggies aren’t hidden either but instead stand out, loud and proud. As in this sweet little mince pies with their pastry cases in an intriguing shade of green. Yes, the pastry features spinach. Not something that would ever have occurred to me, but certainly something I will be trying very soon. Focaccia is one of my favourite breads but I’ve never made a sweet version before, and this recipe from Alexandra aka The Lass in the Apron makes me want to bake some. Right now. Sugar and spice and all things nice – in a bread. Just heavenly, I say. If you’re not keen on traditional mince pies, these dainty fruit pies from Michelle at Utterly Scrummy are the pies for you. Filled with apples, pears, plums and cranberries and spiced with cinnamon and vanilla, these are a much lighter take on the traditional mince pie but look just as delicious. These edible decorations from Louisa at Eat Your Veg are incredibly cute and would be such a fun activity to do with the kids in the run up to Christmas. And I know just how much my little ones would appreciate the addition of chocolate to the gingerbread too. Sounds scrummy! Surely nothing sings out Christmas more than cranberries, and this Swiss roll from Jen at Blue Kitchen Bakes provides a lovely lighter alternative to all the chocolate and richness at this time of year. And the sponge also features more of Jen’s Speculoos spice mix – wonderful! Another festive bake up next, this time from me. Here’s my very easy to make tear and share iced buns, flavoured with a touch of cinnamon and lemon, shaped into a simple snowflake design, and sprinkled lovingly with a little confectioner’s glitter. A big hit this Christmas with my two daughters. Ros at The More Than Occasional Baker brings us these cute gingerbread cupcakes next. Decorated with pretty little Christmas decorations and topped with a yummy cream cheese frosting flavoured with golden syrup and cinnamon, these cakes are guaranteed to be a big hit with little people. Next up we have some more lovely Christmas cupcakes, this time from Caroline at Caroline Makes, which she baked for her company’s annual employees’ children party. The cakes are beautifully simple, flavoured with brown sugar and cinnamon and topped with a simple buttercream. I made this festive version of an Eton Mess for our family gathering on Boxing Day and it got an all round thumbs up as an alternative to the traditional trifle I’d usually make. The stewed plum and apple is gently flavoured with cinnamon and star anise, and swirled into whipped cream along with crunchy-but-slightly-chewy chunks of meringue. Ros from The More Than Occasional Baker is back with more festive baking – this time a tasty cinnamon and date cake which is extremely simple to make but is guaranteed to impress your guests. The dates give the cake a scrumptious sweet stickiness which, according to Ros, most importantly “does not taste like dates”! Another entry from Caroline at Caroline Makes who brings us a batch of her Christmas cinnamon shortbread. These would make a perfect edible Christmas gift, and are particularly suitable for diabetics as they are very low in sugar. Yet more sweet treats from Caroline at Caroline Makes as she shares her third entry – chocolate cinnamon rolls. These lovely sticky, chocolately rolls would make a wonderfully luxurious breakfast or why not try them for a delicious dessert? Next we have some irresistible gluten-free cookies from Elizabeth over at Elizabeth’s Kitchen Diary. She baked these beauties for her dance teacher who happens to be gluten intolerant and can never usually eat the cakes brought in to share at her weekly ballroom dance class. They also proved very popular with Elizabeth’s youngest who kept stealing them off the rack while they were cooling. I can see why! I’ve wanted to make stollen for ages now, and with this next entry I think I might have discovered the perfect recipe to try. This spiced stollen tray bake comes from Laura at How to Cook Good Food. It’s a fantastic last-minute festive bake, much lighter than the traditional Christmas cake, and filled with marzipan and spices it just has Christmas written all over it. Next we have another festive shortbread recipe, this time from the very creative Choclette at Chocolate Log Blog. She flavours her shortbread with orange, cinnamon and white chocolate for a fabulously zingy, spicy Christmassy treat, although I don’t think I’ll be waiting until next Christmas to give this recipe a whirl. Doesn’t this dessert look just divine? I always think poached pears are a very sophisticated sort of pudding, and this entry from Angela at My Golden Pear certainly looks the height of sophistication in my eyes. The pears are poached in red wine, sugar, cinnamon and vanilla and served with a brandy snap tuile filled with white chocolate cream. Dreamy. I really can’t wait to try this trifle recipe from Vohn at Vohn’s Vittles which has homemade gingerbread soaked in brandy at the base – what a marvellous idea. It also features layers of bramble jelly, lemon curd and lashings of whipped cream. This definitely sounds like my kind of trifle. Last up is my recipe for mulled cider, which includes chilli and black peppercorns for a spicy kick. I’m not all that keen on mulled wine but in recent years have developed a real fondness for mulled cider – must be due to having lived in the West Country so long! Kate from Veggie Desserts for her amazing Mince Pies with Spinach Pastry, which I’m sure you’ll agree were such an imaginative and original entry. Kate wins an amazing Tasting for Two voucher from the good people at Buyagift. With this tasting experience, Kate and her chosen companion will get to discover a whole world of new tastes, textures and exciting flavour combinations. From sweet or savoury, great British grub or international cuisine, there’s a great selection for her to choose from – including refined afternoon teas, olive oil tasting, sushi making, cookery classes, brewery tours and wine tasting experiences. I can’t wait to hear what you go for, Kate! So congratulations once again to Kate, and thank you to everyone who took part in The Spice Trail this month. Watch this space for news of January’s challenge. Happy new year everyone and here’s to a super tasty 2014! 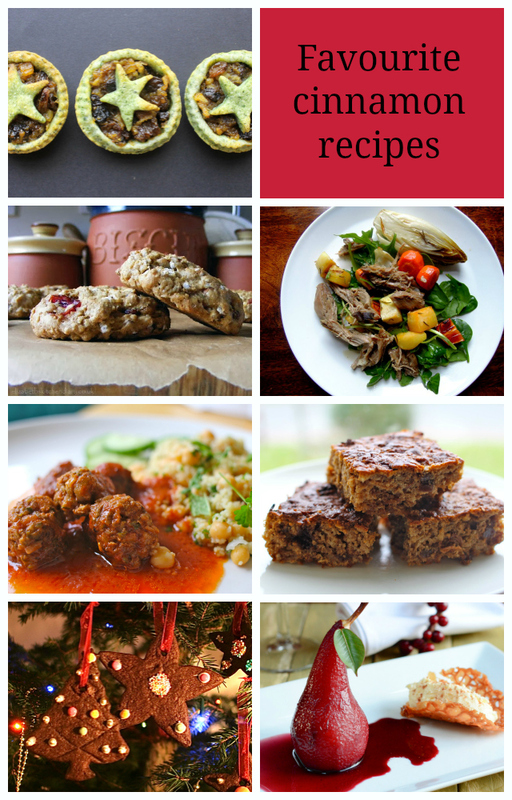 Some lovely looking recipes. I made some cinnamon star biscuits I was planning to enter but unfortunately I just haven’t managed to blog about them yet. I’ll do my best to take part in the next one. Oh my, I don’t think I shall ever be stuck for things to make for Christmas ever again – what a fabulous array of spicy treats. Cinnamon is my number one favourite spice. Thanks for a great round-up and a very Happy New Year. Fabulous cinnamon challenge Vanesther and an even more fabulous array of incredibly varied entries. As for festively coloured spinach pastry, all I can say is genius, and such a deservant win! What a gorgeous, scrummy collection – the New Year diet will definitely have to wait, having looked at these.